Death Traps: Volume 1 ($3.99): What’s a base without a good death trap or three? Written by Base Raiders author Ross Payton and Caleb Stokes of Hebanon Games, Death Traps Volume 1 is a collection of five unique death traps is perfect for any Base Raiders game. It can also be used in nearly any Fate powered system. From the high tech threat of sentry turrets and shrink rays to the mystical security of the Vigil, there’s something to challenge any group of Base Raiders! Sentry Turrets: Miniguns to Plasma cannons! The Vigil: A community of mystically compelled guardians. Build-A-Base Bombs: Nanoswarms can build bases AND dissassemble thieves at the same time! Gritty Gas: Bio-engineered weapon that amplifies physical and emotional trauma. Shrink Rays: No bonus strength, just an incredible reduction in size. Can it be reversed? Who knows! 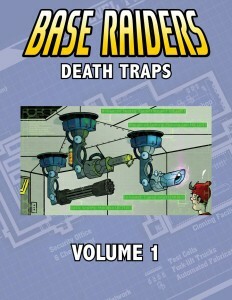 Purchase Death Traps: Volume 1 at the Base Raiders store or on DrivethruRPG. New Teams: Avalon’s Ideal ($1.99): Not all antagonists are villains. Some are misguided heroes. A group of devoted fans to a missing superhero attempt to live up to their idol by putting on super hero costumes, taking dangerous super soldier drugs, and hitting the streets to fight crime. Too bad those illegal super soldier drugs are expensive, so they take to raiding abandoned bases so they can afford to power up. They want to do good but they can’t separate the heroes from the villains. 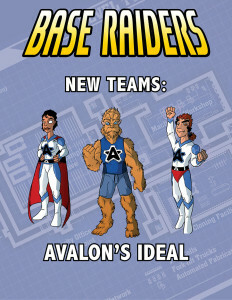 Avalon’s Ideal presents a rival team of base raiders who are trying to live up to the standards of the superhero Avalon. By giving themselves superpowers and assembling a team of devoted fans, they think they can fill the gap left by the missing hero. They are mostly untrained and have rather dogmatic views about good and evil. They could become fanatical zealots or great heroes, depending on who they meet and how they are treated. This supplement stats out the three leaders of the team and gives an adventure seed, showing how they can be used. If you need more antagonists to throw at your players in a Base Raiders game, look no further! Listen to the Base Raiders actual play The Wild Hunt to hear how they can be used. Purchase New Teams: Avalon’s Ideal at the Base Raiders store or on DrivethruRPG. Written by Kyle Carty of Rollplay Studios. Awesome! I love the Deathtraps. Ross, what are the names of the two hapless baseraiders in the Deathtraps art? I think one is Caped Goat, judging from the sentry gun piece. But who’s the other guy, with the “Ac” on his shirt?